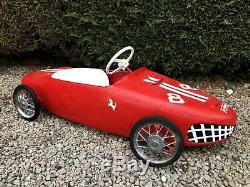 For Sale is a Ferrari 156 Sharknose Formula 1 pedal car. It was manufactured by the French company, Morellet Guerineau (MG), circa 1961, using pressed steel. This is the even rarer number 8'De luxe' version. It appears to have been repainted over its original blue paint, as this can be seen coming through in certain places. This was sourced from the south of France, and subsequently imported by us to the United Kingdom. 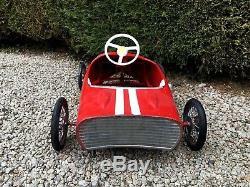 The Pedal car is in a state where it can be left in its current patina, or can be fully restored. All mechanisms appear to be working, however it hasn't been tested with a child inside. 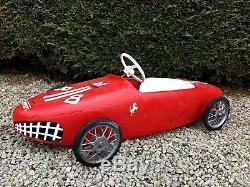 I would assume this be more a collectors item, however it could be suitable for a child should one wish. The item will be well packaged to minimise risk of damage. Any questions please feel free to ask. 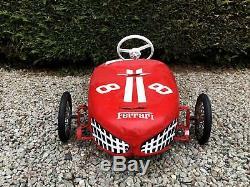 The item "Ferrari 156 Sharknose F1 1960's Vintage Metal Pedal Car Morellet Guerineau" is in sale since Thursday, March 29, 2018. 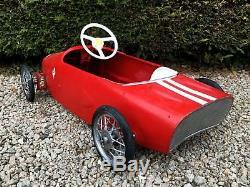 This item is in the category "Toys & Games\Vintage & Classic Toys\Other Vintage & Classic Toys". 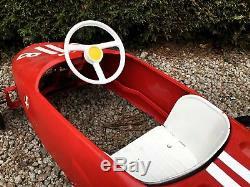 The seller is "cayzer" and is located in Coventry. This item can be shipped worldwide.